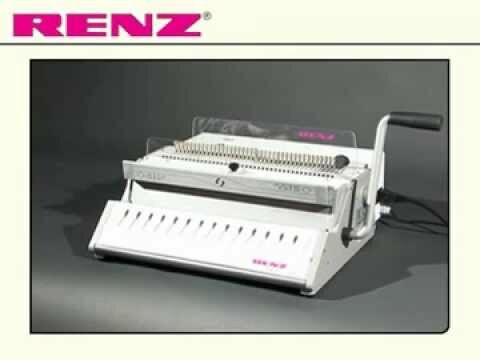 The RENZ SRW 360 comfort is a combined electrical punch and manual closing machine for RENZ RING WIRE® wire comb binding in 3:1 pitch (modular electrical drive required for electrical operation). Suitable for office use, the SRW 360 provides secure and durable binding, with 360 degree rotation, for a professional presentation. The compact electric punch, binds manually and is an inexpensive solution for shorter and medium-sized runs. The punching cycle uses a foot switch and there are 42 selectable punching dies and a variable margin control for perfectly adjusting to formats up to 36 cm. The SRW 360 Comfort punches up to 22 sheets (2.2 mm) and binds up to 135 sheets. The SRW 360 Comfort provides ergonomic work flow from top to bottom. Supplied with a wire holder for the binding elements. When binding, comfortable and easy insertion of the pages is achieved and the best cutting pressure ratio is produced. Thanks to its modular construction, the SRW 360 can be upgraded with an electric drive, creating an electric punch and manual closing machine. Compact, strong construction quality made in Germany.